Built in 1886 for $1,137.20, this structure is the first edifice built for Christian Science services in the world. Although the Mother Church in Boston had started a number of years before, no building had been completed for the express purpose of worship until Oconto’s church was erected. It started in 1883 when Hugh McDonald, owner of a sawmill in Fort Howard, now Green Bay, heard a steamboat inspector say, “My wife is getting better. She is having something they call Christian Science.” Mr. McDonald’s wife had been seriously ill, so he questioned the inspector & learned of her treatment by a Christian Science practitioner in Milwaukee. But Mrs. Emma McDonald was reluctant to make the trip since she felt she had very little time to live and should spend it with her family. She did go, however, and upon finding that the treatment helped her, she sent for her friend, Mrs. Laura Sargent of Oconto who was also in ill health. Both women returned home, healed and with copies of Science and Health with Key to the Scriptures by Mary Baker Eddy, then in its seventh edition. When Mrs. Eddy was in Chicago in 1884 to teach a class, several women from Oconto went to take instruction, including Mrs. McDonald, Mrs. Sargent, Mrs. Lovina Millidge, and Miss Elizabeth Beyer. 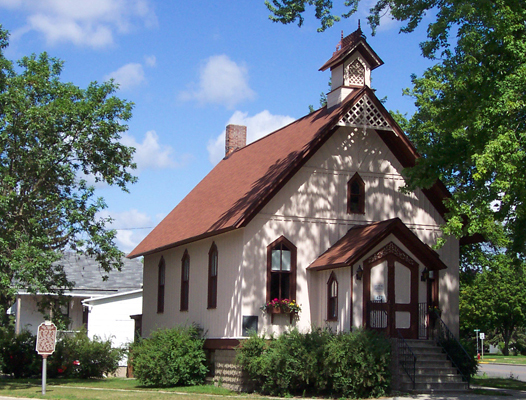 Upon returning to Oconto, Mrs. Millidge opened her home to the students of Christian Science and for Sunday worship. The group steadily grew through healings and it was decided that a church should be built. Mrs. Eddy gave her permission, and Mrs. Victoria Sargent accepted donations. Many who were not Christian Scientists gave funds, as Oconto was then a “hard” lumbering town and it was thought another church would be a good influence. With the exception of modern lighting and heating installation, the church remains virtually unchanged. Built on cedar pilings with a wood exterior, a basement was added in 1916 when a heating plant was installed. The Church maintains a reading room in the basement, containing historical documents relating to the church, and current publications about Christian Science. The worship area contains one hundred birch chairs, painted a light mahogany. A Kimball pump organ provides music. The lights are reproductions of the kerosene lamps which were first used in the building. The cut-glass globes are mounted on circles of wrought silver suspended on silver cables from the ceiling. During the summer, the window boxes are planted with flowers and bridal wreath bloom annually. For many years a large circular concrete watering trough stood near the front entrance. Thirsty horses could find some respite here as could dogs that had their own small watering trough near the bottom. The trough has been turned into a flower planter and now stands at the corner of Main Street and Superior Avenue in downtown Oconto. A trust fund to help with the upkeep of the church was established in 1979. Although the congregation has never been large, the church has almost continuously held Sunday services since 1886. Presently they are held at 9:30 a.m. on Sunday. This structure was placed on the National Register of Historic Places in 1974. Tours are now available May 1 through October 15. Visitors may arrange a tour by contacting the Oconto Visitor Center in Wagner Shell Food Mart at 517 Smith Avenue, phone (920) 834-5711.